An interesting and thought-provoking read for all developmental education instructors, especially those teaching in California. Remedial education courses has always been a bit of an obstacle; statistics show that the longer it takes for a student to get to college level courses, the less likely it is for them to complete, transfer, or even graduate. The state of California has decided to make a move by eliminating remedial classes come Fall 2018 in hopes of increasing the students' chances of transferring to a four year institution and starting their career. College presidents and department heads are working feverishly to determine the best model for this new bill. By fall 2018, California community colleges will no longer offer remedial education classes due to the passing of Assembly Bill 705, often referred to as California Acceleration. The bill was approved by Gov. Jerry Brown on Oct. 13, acting as an amendment to the Seymour-Campbell Student Success Act of 2012. Cosumnes River College President Edward Bush showed support for the new legislation. Bush said that he strongly agrees with the bill in that students should be able to complete required English and math courses within one year. The 2016 overall graduation rate at CRC for full-time students who began college in 2013 was 25 percent. The transfer rate of the same students was 8 percent, according to the National Center for Education Statistics. The purpose of the new legislation is to remove opportunities for students to drop out by providing fewer courses below college level, said Lisa Abraham, head of the CRC English Department. Students will instead begin at college-level courses, like English Writing 300. “Our department is currently looking at a number of different options to address the bill and to reconfigure the types of composition classes that we offer, so we’re in the middle of that process now,” Abraham said. Abraham said that a model the department is researching is a version of English Writing 300 that will also include a 2-unit corequisite class to provide support for student skills. Abraham said that this is one of many models that is being considered across the Los Rios Community College District, but the models are in their early stages, so there is very little data beyond the initial stages. The removal of remedial classes is one of two main changes to community college education procedures being made by the legislation. The other change is the reevaluation of assessment procedures in order to more accurately place students in English and math courses. The purpose of the new assessment procedures is to help place students in classes that they are likely to complete without placing them too low. One project that has been used when determining how high school transcripts can be used to determine college competency is the Multiple Measures Assessment Project, led by the Research and Planning Group for California community colleges. 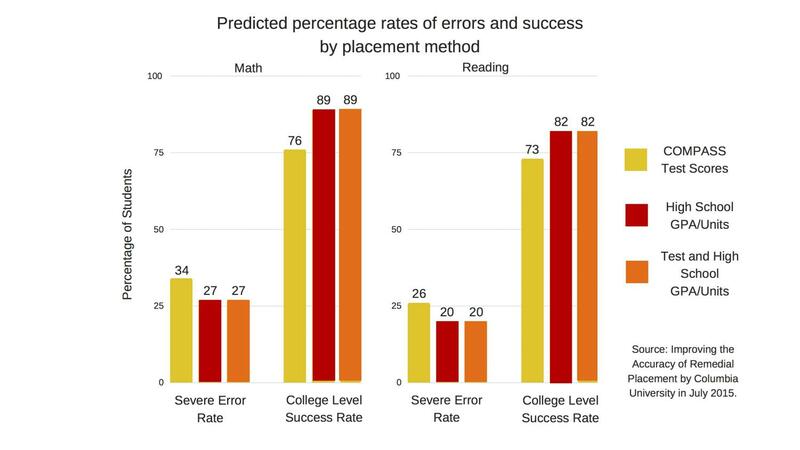 The MMAP is “a collaborative effort led by the RP Group and Educational Results Partnerships’ Cal-PASS Plus system to develop, pilot, and assess implementation of a statewide placement tool using multiple measures,” according the RP Group website. The project aims to provide guidance in the process of reevaluating the way that California community colleges will conduct assessment procedures. “It’s basically a set of guidelines in terms of what GPA is the cutoff to determine ‘college ready,’ or determine one level below college level, or two levels,” Bush said. “Basically, it’s a rubric.” Reviewing high school transcripts is just one of the methods that CRC will be employing to aid in accurate placement of freshman students, one that CRC specifically had been working on prior to the approval of the bill. Jason Newman, CRC campus president for the Los Rios College Federation of Teachers, said that the implementation of the legislation at the school will likely have an impact on the faculty, though it is predicted to be a “minor to moderate challenge.” Newman said that there is some potential for faculty to lose their positions if they do not have guaranteed courses, but that is currently too early in the transition process to say this with certainty. “It’s something we’re watching closely for the impacts to part-time faculty,” Newman said. Newman also said that the executive board for the LRCFT is being very skeptical about California Acceleration. Newman said he will remain neutral on the issue until he receives more data about potential outcomes. Bush said that faculty should be secure in their positions since there will be a new demand for more higher-level courses. Bush said that all instructors in both English and math are qualified to teach all course levels, so faculty will have many opportunities to continue teaching. Bush also said that the school administration will be encouraging students to take English and math courses in earlier semesters, so there is the potential for a surge in demand for these higher-level courses. Newman also expressed concern regarding students’ ability to keep up with the new system. Newman said that some students may become overwhelmed, and the new system could potentially leave some students behind in progressing academically. Newman did express optimism though in the school’s ability to fix any potential issues that may arise due to California Acceleration. Bush said that, while there will assuredly be students who are disadvantaged by the new system, there will be opportunities for many more students to succeed. “Now, that doesn’t mean that we don’t figure out a way to even reduce that number of students who are having difficulties making it through the new system; we still have to figure that out. But the fact that we are going to have some students struggle with the new system doesn’t mean that we don’t move to the new system when we believe that the majority of the students will greatly benefit from it,” Bush said. While there is uncertainty in the direction that the new legislation will be taking, faculty and the school administration have been consistently working and debating the best ways in which to implement the new system. Abraham said that the top priority for faculty is to be very thoughtful in the changes that are made, so as to benefit as many students as possible. She also said that faculty from all Los Rios campuses are working collaboratively to make the best possible transition to the new system. “Everybody has the best of intentions. We’re all here to serve students, we’re all trying to adjust to the idea that there’s a different way to serve students better, and we want to do that,” Abraham said. Bush said that he is extremely passionate about the situation and hopes that California Acceleration will be a benefit to students. “When we look at the number of students who are not completing, and even when we look at our students that are completing and seeing the amount of time it takes for them to finish, they’re losing precious time and expending resources, using precious financial aid dollars and stretching out their time longer than it needs to be,” Bush said. “That’s why I’m passionate, and knowing that it’s not their fault that happens, that much of the reason why it’s taking them so long to complete is because we’re operating with a structure that doesn’t support them completing on time. My passion is really fueled by the idea of wanting more students to have the opportunity to get through CRC and move on to their transfer institutions and careers as soon as possible,” Bush said. The stipulations of the new legislation will go into effect in January 2018. CRC will have until the fall semester of 2018 to implement the changes in accordance with the legislation.